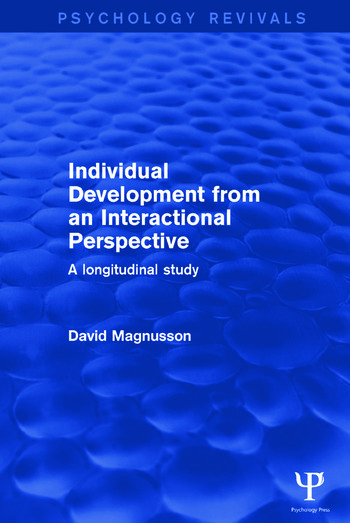 Originally published in 1988, this title presents a longitudinal research project ‘Individual Development and Adjustment’ (IDA), planned and implemented at the Department of Psychology, University of Stockholm. This title concerns the theoretical background of the project, the planning and collecting of data during the second phase of the project when the participants had reached adulthood, and the presentation of some empirical, illustrative studies based on the collected data. Prologue. Part 1: Theoretical Background and the Implementation of the Project 1. A Theoretical Framework: The Interactional Perspective 2. Theoretical and Conceptual Considerations 3. Methodological and Research Strategical Considerations of an Interactional Perspective 4. Planning and Implementation of the Project Part 2: Empirical Studies 5. Characteristics of the Main Cohort 6. Biological Maturation and Lifestyle Among Females: A Short-term and a Long-term Longitudinal Perspective 7. Aggressiveness, Hyperactivity, and Autonomic Activity/Reactivity in the Development of Social Maladjustment 8. The Development of Patterns in Adjustment Problems: Early Age to Adulthood. Epilogue. References. Author Index. Subject Index.